The Gamma Beta Chapter of Omega Chi Epsilon with the new initiates. Three students being inducted into the American Honor Society for Chemical Engineering students. HAMPTON, Va. (January 18, 2019) – The Hampton University School of Engineering and Technology hosted an induction ceremony for chemical engineering students that were initiated into the Gamma Beta Chapter of the Omega Chi Epsilon Chemical Engineering Honors Society. 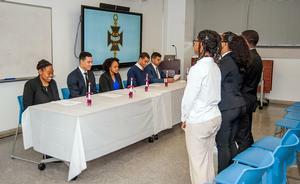 Omega Chi Epsilon is a newly, re-established chapter at Hampton University and this is the first induction ceremony in over 20 years. Omega Chi Epsilon began at the University of Illinois in the spring of 1931, following their key objectives of Recognition, Investigation, Service, and Comradeship. These four are bound intimately together by the fifth objective, Professionalism. To recognize excellence in chemical engineering. To promote original investigation and innovation in the various areas of chemical engineering. To provide service to the Department/School of Chemical Engineering and the student body. To provide comradeship among chemical engineers. To encourage the development of honesty, integrity and social responsibility, the hallmarks of professional ethics. 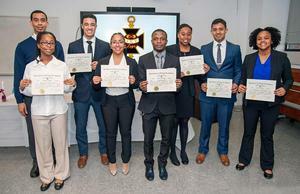 Three students were inducted into the Omega Chi Epsilon Chemical Engineering Honor Society during the ceremony. These students have attained or exceeded the scholastic requirements as stated in the societal constitution, along with good character and ideal support of Hampton University. “I feel moved to be inducted into the Omega Chi Epsilon Chapter with my fellow chemical engineers. It means a lot, honestly. To be recognized for all of the hard work throughout the years. We’ve definitely come a long way as a department and I enjoy seeing the progress we’re making,” said Claude King III, chemical engineering student. "The only honor society at Hampton for STEM majors was Beta Kappa Chi. When I discovered that engineering wasn't on the list for eligible majors, I decided that we needed an engineering honors society. The reinstatement of this Chapter is the first step in the right direction for the Department of Engineering,” said Jakari Harris, President of the Omega Chi Epsilon Chapter. “These new members in the Gamma Beta Chapter of Omega Chi Epsilon National Chemical Engineering Honor Society represent what excellence and scholastic achievement in this department looks like."